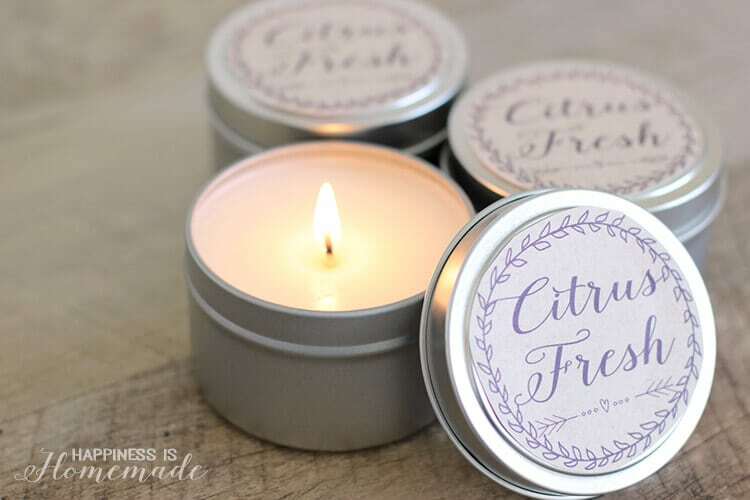 Quick and easy homemade gifts are my favorite, and these incredible DIY citrus fresh soy candles can be made in just about ten minutes! I begin by using a small dab of hot glue to secure the tab of the candle wick to the bottom of the container. This step is optional, but I find it to be helpful in making the other steps run smoothly. 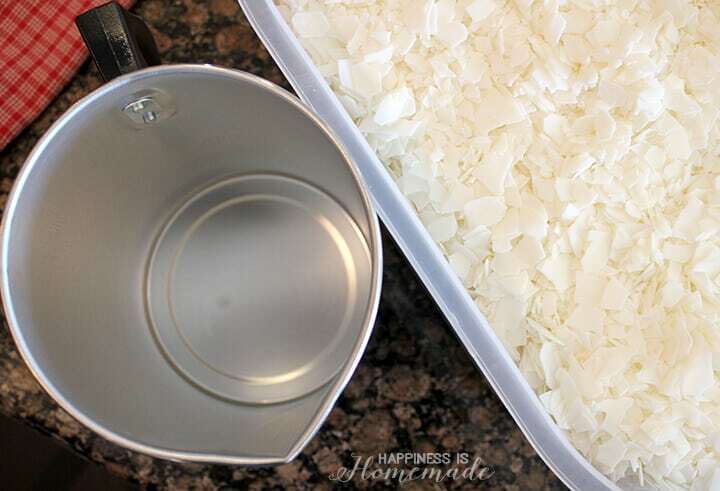 Fill the candlemaking pitcher with the desired amount of wax flakes. Note: I filled my pitcher about 2/3 full of wax flakes to make 7 six ounce candles. Place the pitcher inside a pot of boiling water or double boiler over low heat (approximately 150-180 degrees F), stirring frequently, until wax has fully melted. Mix in 20-30 drops of essential oil for fragrance. 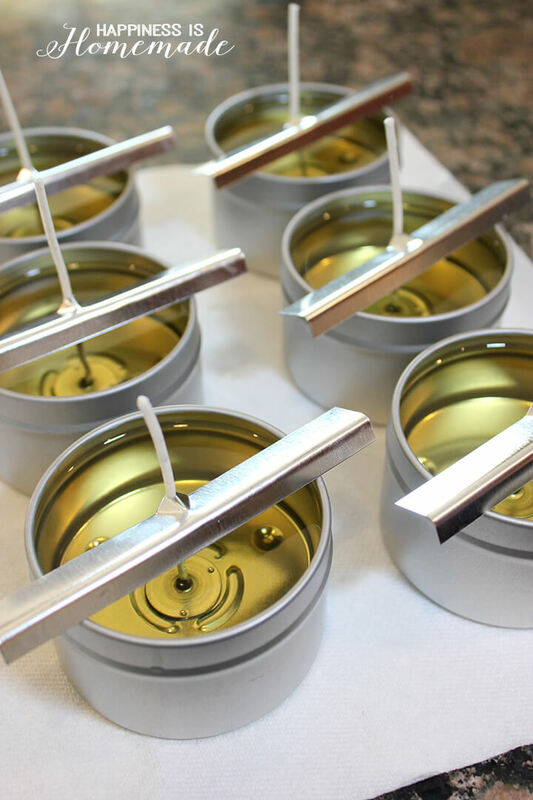 Secure the top of the wick with a wick holder before very carefully and slowly pouring the wax into the tins. Allow the candles to cool for approximately 2 hours. During this time the wax will change from clear and yellowish back to an opaque white color. 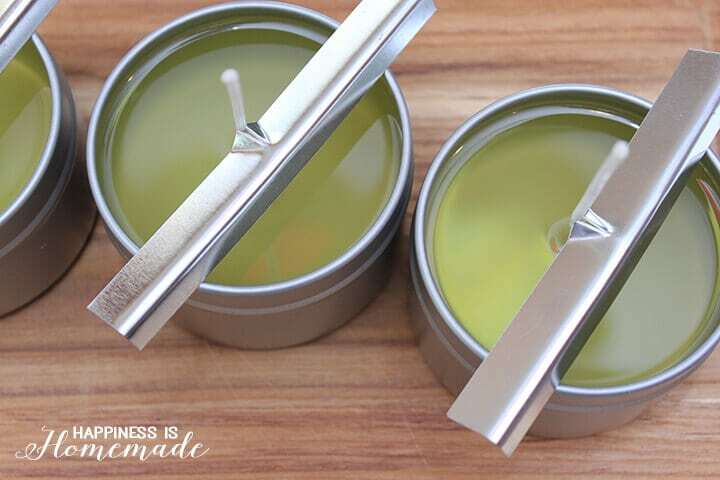 When the wax has completely cooled, snip off the excess wick (leave approximately 1/2″) and remove the wick holder. 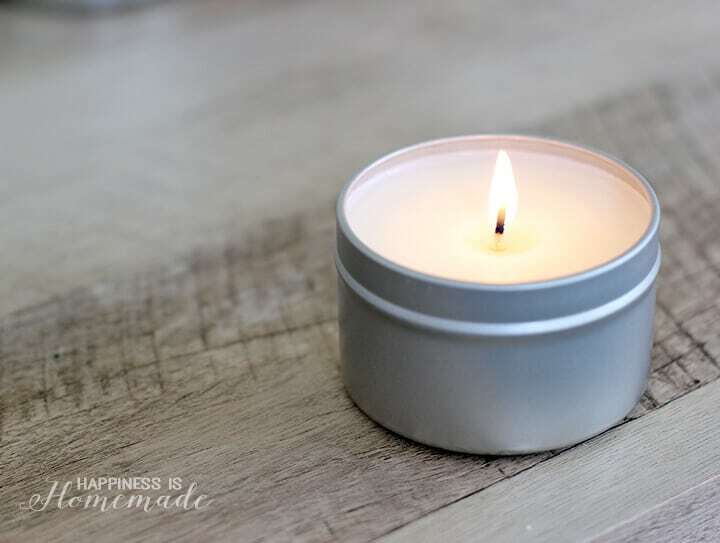 I love soy candles because they are all natural, and they burn longer and at a cooler temperature than traditional paraffin wax. They also produce far less soot and burn cleaner (less excess melted wax), so they’ve quickly become a favorite around here. 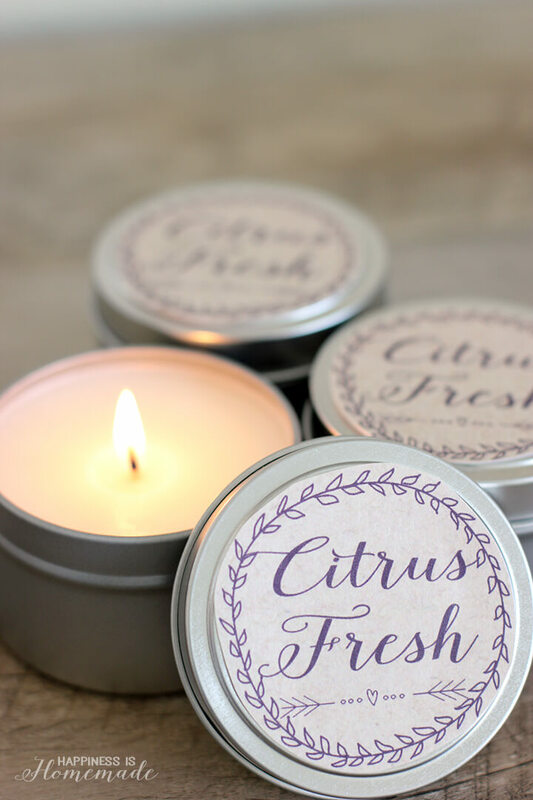 I wanted to dress up the candle tins a bit, so I created some cute “Citrus Fresh” labels for them. You can download and print a copy of the labels by clicking on the image below. 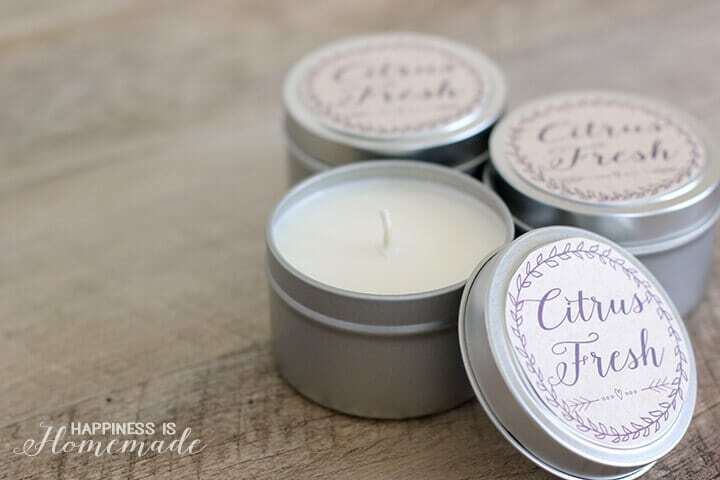 These candles make great birthday, holiday and teacher appreciation gifts! Whip up an entire batch in just a few minutes, and keep them on-hand for unexpected events and occasions! Thanks for the great tutorial. I have not yet made my own candles, but this looks achievable. Have a wonderful week! I appreciate how easy you make this look, seems you have got a system, thats great. I tired to make just a few candles and decided to leave to those that have more patients. lol. Thanks for sharing your post on the Oh My Heartsie Girl ww this week. I had no idea that it was this easy to make something like this! What adorable gifts! I’ve always wanted to try to make my own candles. And I love these printables! Thanks for linking up at Found & Foraged! Thank you for sharing this great tutorial. I really want to try to make my own candles. 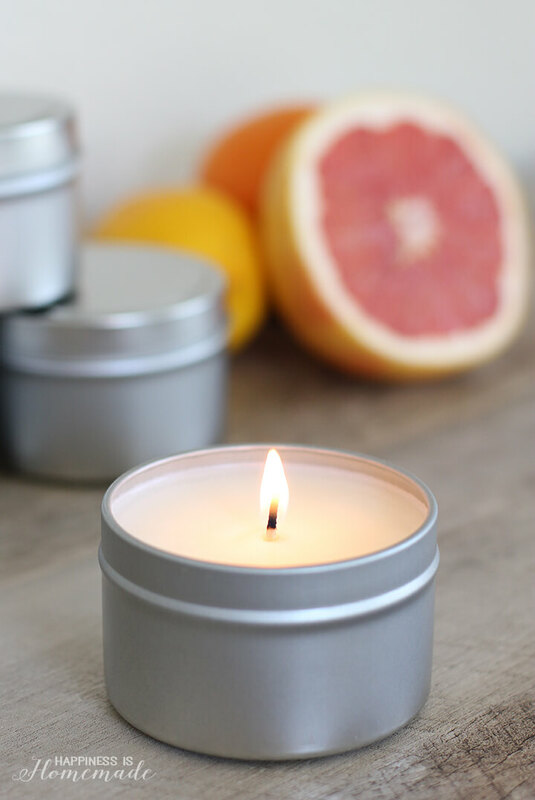 These soya based candles are great for a greenie like me since they are more eco-friendly. I am stopping by from the Thursday Favorite Things Blog Hop. What an awesome tutorial – I love this! 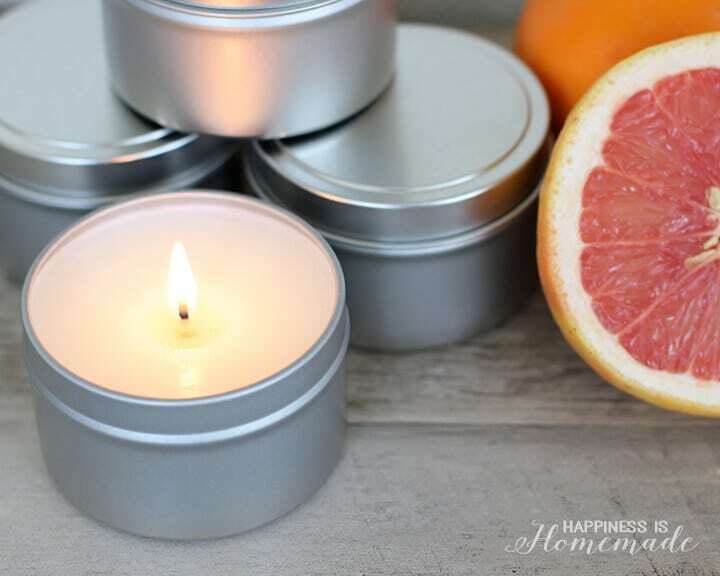 My daughter loves soy candles, so I am going to have to try it! Thanks so much for sharing it with us at #FoodieFriDIY…I’m pinning and sharing! Hi you don’t say what type of wick to use, or the pouring temperatures of the wax??? I love these! You make it look so easy I just might try it. Thanks for the printable as well! Featuring on tomorrow’s Mom 2 Mom Monday Linkup. Thanks for joining! These would be such wonderful little gifts! They’d go especially well in a spa gift basket! 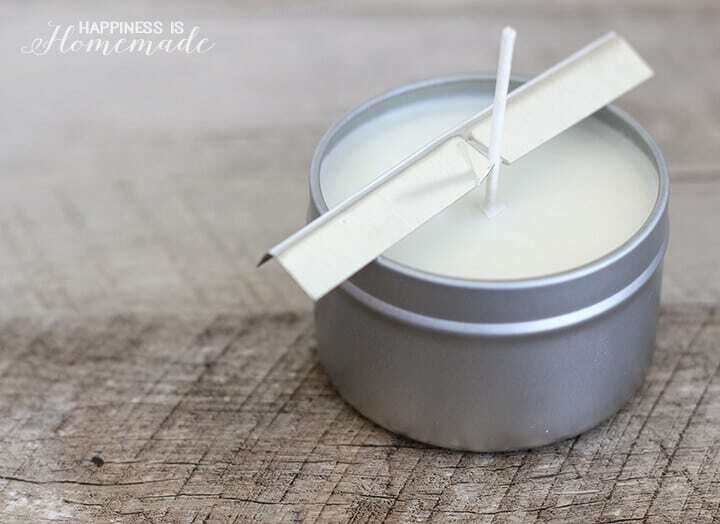 This is a great tutorial on candle making. I’m inspired to give it a try! Thank you for linking up with us at the #PureBlogLove Link Party! Please join us again Thursday night at 8 p.m. EST. http://www.homemadefoodjunkie.com. I can’t wait to see what you bring! I bought all the supplies from Amazon and they arrived yesterday afternoon! Can’t wait to get started on these this Saturday for Christmas gifts for friends. 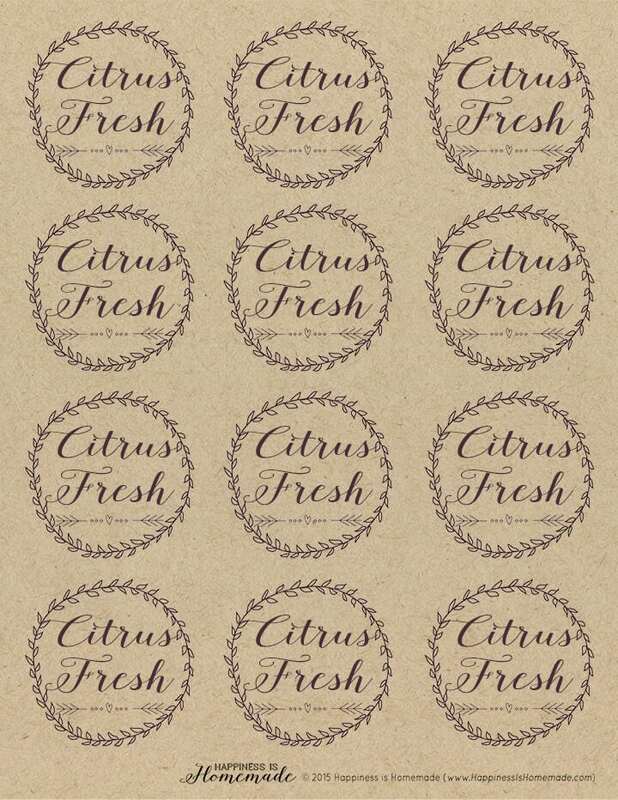 I know this is a big request, but is there anyway you would offer that same printable label kraft sheet but with instead of “Citrus Fresh” the words “Holiday Joy”? I am using the Holiday essential oil from doTERRA in these candles, but adore your label so much. I love these! What a great gift idea and the printables are such a special touch! I’d love to add these to a little spa gift basket this Christmas!